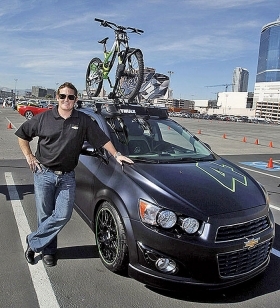 Racer Ricky Carmichael shows off the Chevrolet All Activity Sonic concept, which has a matte black finish and roof rack. Racer Ricky Carmichael wanted to dream up a car that would provide some fun when he wasn't at the racetrack. The result: the All Activity Sonic concept shown last week at the Specialty Equipment Market Association show in Las Vegas. It has a matte black finish, satin chrome pieces, a high-wing spoiler and a roof rack for mountain bikes, wakeboards and other gear. Said Carmichael: "I live my life on the go, and this Sonic really represents that active lifestyle." Cristi Landy, director of small cars for Chevrolet, said: "This vehicle really has captivated a lot of people. It's really sporty and has a cool blend of elements." Chevrolet officials are aiming for the Z-Spec package, which includes upgrades to the vehicle's grille, paneling, ground effects, spoiler and wheels, to be available on 2013 models. The Chevrolet Cruze compact also was on display at SEMA, but Chevrolet stresses the possibilities for accessorizing the Sonic subcompact. "We're playing up one of its strengths," said Cristi Vazquez, Chevrolet communications manager for the Sonic and Equinox nameplates. "The Sonic is more performance-oriented and the Cruze more luxury-based."